I don’t know where to even begin confessing…About a month ago I started a new job as a Technology Integration Specialist and I’m just beginning to figure out what on earth that means! I’m planning to continue sharing resources and ideas, but they might look a little different because I’m not just teaching 4th grade anymore! If you are lucky enough to have any iPads in your classroom you should check this out…I will continue to add to the list as I find more ideas and resources! One that we are really excited about is ePud Bud and this could be used in any classroom, not just the iPad blessed ones! 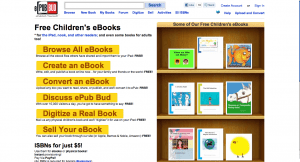 You can use this website to make your own eBooks! 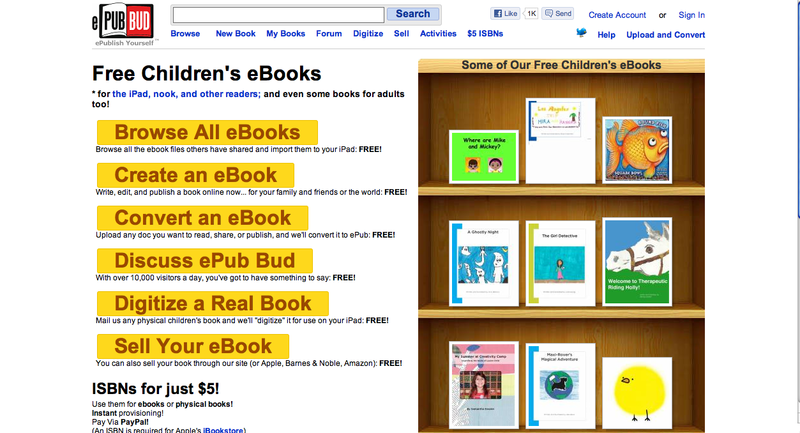 You can scan pages in or have kids create them, but they can be loaded on any device or viewed on the website. Cool, cool, cool! Confession: This year is the first year I’ve given out my personal cell number to parents. I don’t know why I thought that if I gave out my number people would abuse it. Did I think I would have parents calling me in the middle of the night? Silly, right? The reality is giving the parents a line of communication outside of school hours has been great! Many parents work until 6 or 7, and by that time they can’t contact me at school. Also, I’ve had texts from parents who I had never had contact from before; they feel much more comfortable sending a text than actually calling me. Call from a Grandmother: Miss O, I keep trying to show Lindsey how to do two digit multiplication but she insists that I’m not doing it “Miss O’s way”…can you please help us?! 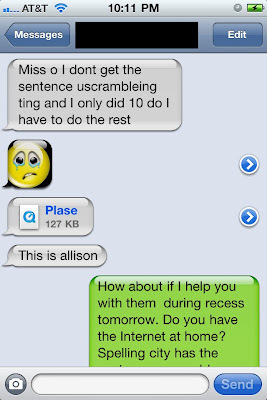 Student Text over Spring Break: Miss O, I am car sick! 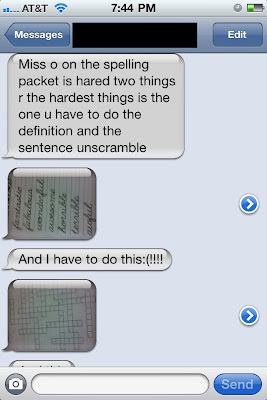 I also have a student who texts me her spelling words every Friday! So, yeah, I get a few random texts telling me about being car sick and pictures of new puppies, but it doesn’t bother me a bit! 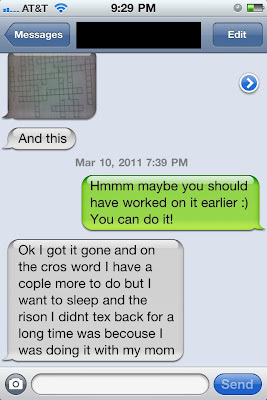 I really like the connection between home and school, and I always get a good laugh at my kids’ texts! Teachers: Do you give out your personal numbers? How do you stay in touch with parents? Confession: I have a stack of grading 6, 7, 8, 9 inches high that has been collecting in my “To be Graded” bin…and I didn’t even look at it this weekend! I had a paper for my master’s project, grading, planning and blogging to do this weekend, but it was 90 degrees, sunny and breezy. 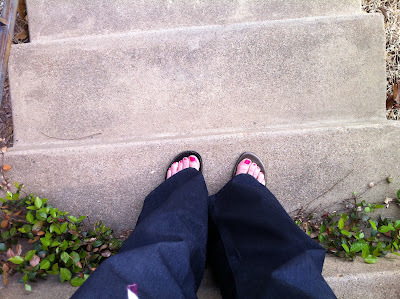 The patio was calling my name…and I answered! So, the grading is not graded, the blogging is not blogged, the planning is not planned, and the paper is not…papered (eh, it almost worked). 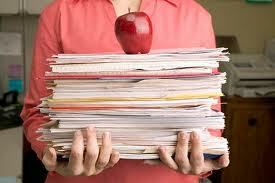 I guess you could say that the weekend ate my homework. You can hardly tell, right? Ei, yi, yi! My kids got such a big kick out of this and I had a good laugh too. 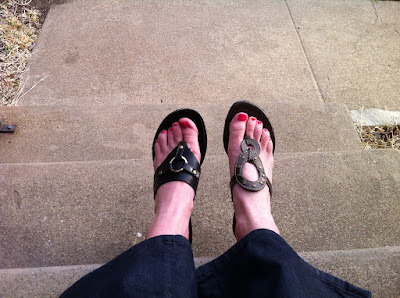 We decided that Friday would be mismatch shoe day in Miss O’s class. Life sure does teach this nerdy teacher not to take herself too seriously! Confession: I subscribe to dozens of educational blogs…and sometimes I get tired of the “education today is bad…” mantra. I know as a progressive educator I should be passionately raising my fist in agreement that we have a broken system and fighting to change it. But sometimes oftentimes I get frustrated. 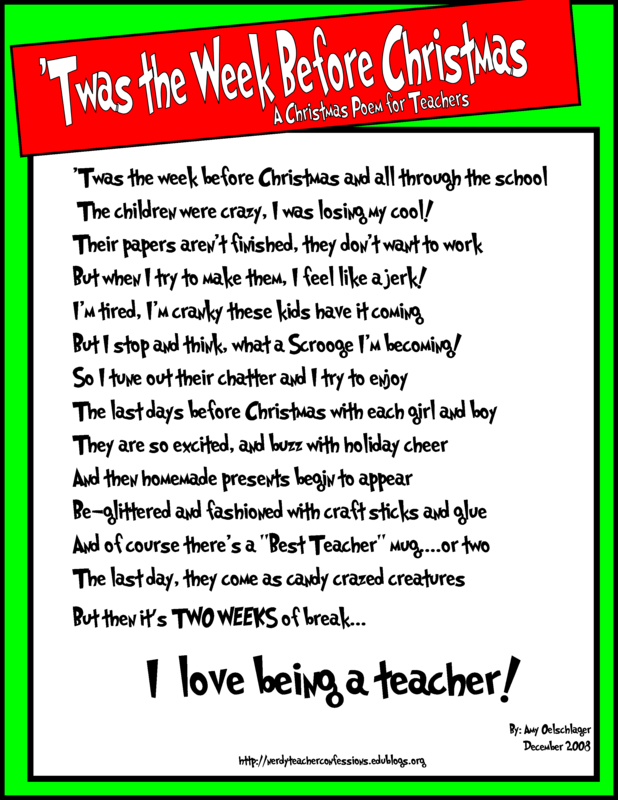 So many blogs rag on teachers, “Bad teachers do this…”, “Teachers won’t change…” and I understand where they are coming from. Yes, there is a lot about education and teachers that needs to change, but what those blogs, videos and articles don’t show is that most teachers love their students and their profession and do not intentionally use outdated practices. I experienced this last year when I worked as our campus’ Technology Specialist. I started out the year frustrated with teachers for not wanting to change, but as the year went on, I realized that every single teacher wanted the best for his/her students and desperately wanted to integrate the technology and ideas that I was offering. The problem was they literally didn’t have the time in the day to learn how to teach differently. Some might paint these teachers as unwilling and stuck in their ways, but I saw a different side. I know how the world sees teachers, but I see something different. I see committed teachers who arrive at school early, tutor struggling students for an hour after school (with no compensation), then stay until 6 o’clock planning and preparing for another day. I see concerned teachers who use their personal resources to make sure their students have all of their physical needs met at school (buying food, clothing and toiletries)–then worrying about them every night. I see caring teachers who give up their lunch breaks, evenings and weekends to eat with students, go to their basketball games and get to know their families. I see compassionate teachers who cry at the end of the day because they feel like they still weren’t able to do enough. I see relentless teachers spend countless hours trying to figure out how to reach a single students and will not give up. I see teachers who are putting their blood, sweat and tears into their students and practice, and still fighting an upstream battle. I will keep on reading all those blogs and articles on education reform, and I still believe that education has a long way to go. I will continue to provide opportunities for teachers in my building to integrate technology and learn how to make their practice more relevant. But I will not talk down on those teachers, because I know what I see. -Go for a walk/run everyday. Yep, I’ve got plans 🙂 I just felt like I needed a big giant sigh and a nap! So I’m spending my days reading and my evenings with friends, and it is wonderful! 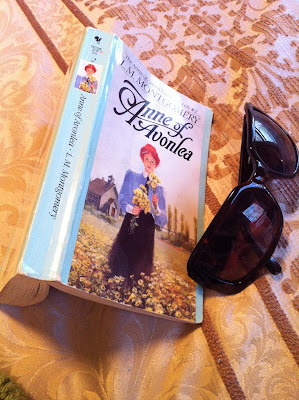 I didn’t make it to the library on Saturday to pick up books for my week of relaxation, so on Sunday afternoon I picked up my favorite book of all time, Anne of Green Gables, by L.M. Montgomery to read while I sat outside on the patio. **Is there a book that you reread over and over again? 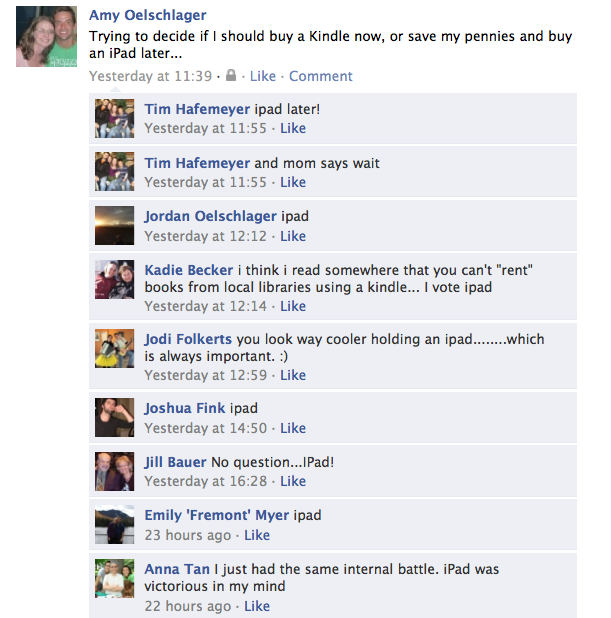 **Do you have an opinion on eReader options?